← Conflict Free Diamonds: Really? A friend recently pointed out that some jingle shells are rippled. She even wondered whether they were a different species! 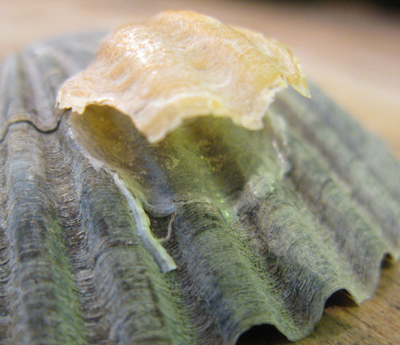 Others opined that the ripples were due to the mollusc adhering on a rippled substrate, for example on top of a scallop with pronounced ripples in its shell structure. Today I think I found some evidence for this on our beach. The following are a few pictures of a brown scallop that had just washed ashore with still adherent orange jingle shell. 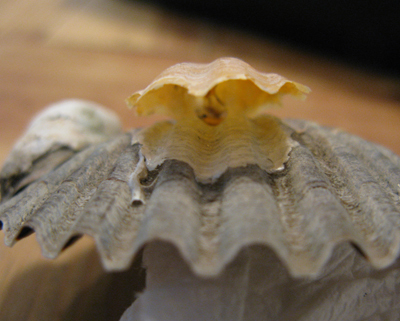 Both the lower valve and the upper, orange valve of the jingle shell are rippled to closely adhere to the rippled structure of the scallop. 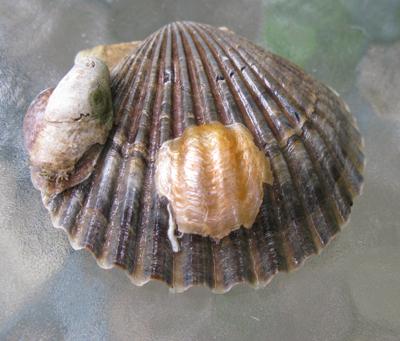 Conveniently there was a slipper shell adherent on the same scallop, or rather 2 slipper shells, one on top of the other, as they often tend to do. The slipper shells showed no ripples. 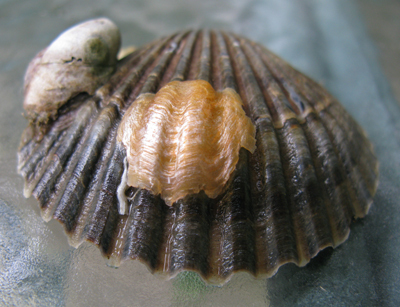 Even the margins in contact with the scallop had not assumed the rippled structure of the scallop. How to interpret these findings? I would say that the Anomia simplex has resided on this very same scallop for a long long time and perhaps for its entire life! How else would it have assimilated the scallop structure over its entire shell structure for both lower and upper (orange) valves? By contrast, I think the slipper shell likely migrated on to this substrate and had previously lived on a different substrate. 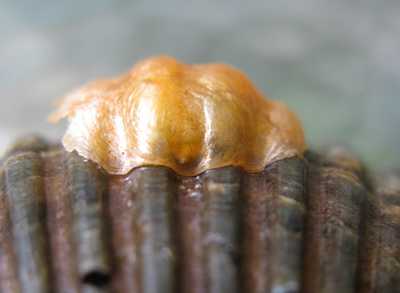 The jingle shell could be described as a “resident” and the slipper shell as a “migrant”! While this is but one example and it would be dangerous to conclude that all A. simplex behave this way, it is none the less OK to conclude that some A. simplex may grow up from infancy and remain on the same substrate for their entire lives! I would welcome your thoughts! This entry was posted in Conchology - Shells and tagged anomia, bay, beaches, Conchology - Shells, east hamtpon, Hamptons, jingle, jingle shells, oyster, saddle oyster, Shells, simplex, springs, toe nails. Bookmark the permalink. I think I have to agree with you! We have been finding tons of Jingles here in NJ and we started to find a few that actually looked like scallops and we thought they were a different species. Thank you so much for the great pictures and the explanation!! Someone esle thought there might be a new subspecies of jingles with a ribbed shell! Thanks for your comment. I have been collecting jingle shells from our beach as I find them very intriguing. I have also found rippled jingle shells attached to scallop shells and came to the same conclusion as you have; they grew there and conformed their shape to the scallop shell. I have collected some jingle shells that have very thick upper and lower valves , making them not as translucent as usual. I have found jingle shells very curious since I was a child. I have bags full of them, separated by color and size for a future project and to fill clear glass lamp bases. Thanks for your input. Keep up your collection!